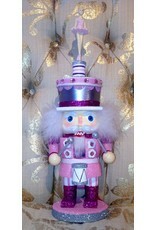 KURT S. ADLER HA0235 TWIRLING BALLERINA MUSICAL NUTCRACKER - Attitudes Dancewear Etc. A beautiful and musical ballerina stands on the hat of this pink drummer. Simply turn her around and she’ll play you a song as she spins!